OK, this is a weird one. I don't really like chocolate cake but I'd heard prunes were great in choc cake and even though I also hate prunes (AKA Torture Fruit), I thought I would try a pruney choc cake for Mr Vegan's birthday. I've been obsessing about this for weeks and I'm not sure why?! I thought I'd soften the blow by adding orange to the recipe, seeing that choc and orange are such a match. Anyhoo, I cobbled together several recipes and this is the result. Successful? YES! 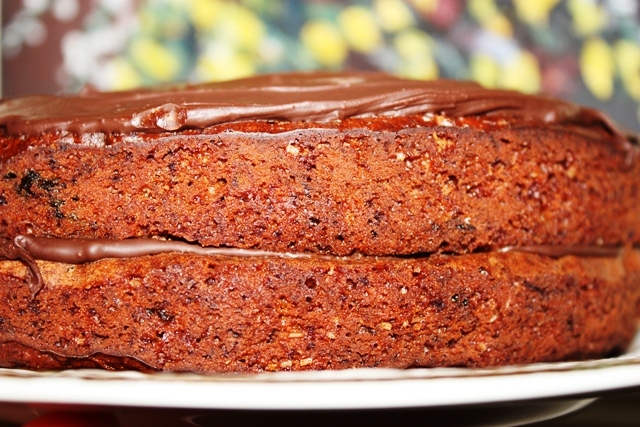 It's an absolute treasure of a cake: dense, sweet, moist. Really yummy. 'A keeper,' Mr Vegan says. Nice to 'see' you here! Would love to try that raw cake - send me the recipe if you get a chance.